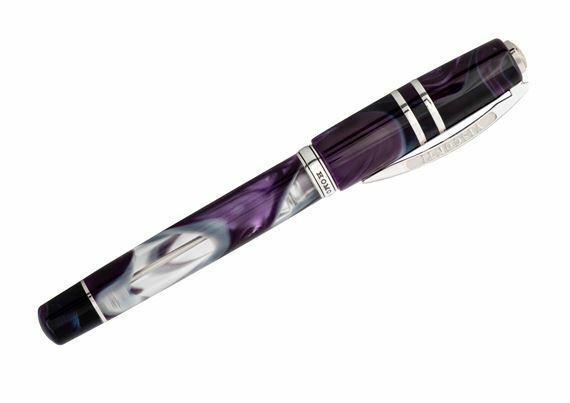 Order your Visconti Homo Sapiens Midnight in Florence Fountain Pen today from FahrneysPens.com. Fine Pens, Refills & Luxurious Gifts – great prices & fast shipping. 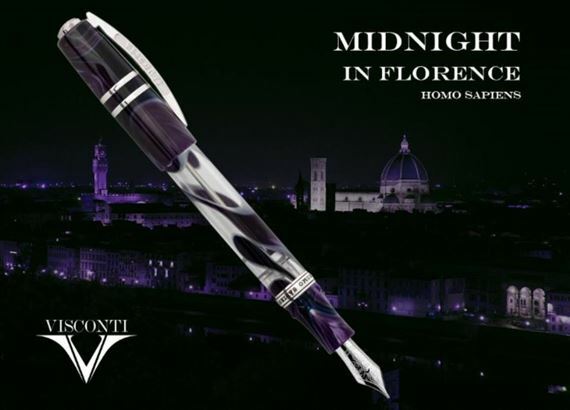 The Midnight in Florence was inspired by Visconti's hometown, the ancient city of Florence, Italy. When darkness falls across Florence, the city reveals aspects of its beauty not shown in daylight. Street corners and buildings change identity as they are shaded by a multitude of darker tones of gray, blue and purple. The Visconti team has worked hard to replicate these beautiful colors in a new unique resin palette throughout the pens body and cap. 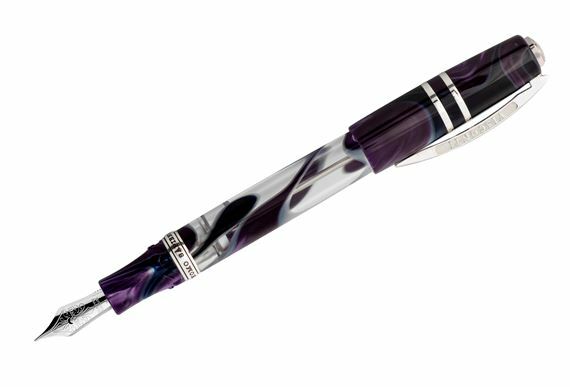 The barrel of the pen features ribbons and swirls of shaved acryloid, suspended in a clear acrylic resin while the cap and plunger feature the same colors fixed into in a marbleized navy blue resin. All trims are crafted in 925 sterling silver. The Midnight in Florence is truly a spectacular pen. Available as a fountain pen or rollerball, the collection is limited to 888 pieces. The fountain pen features Visconti's patented Double Reservoir Power Filler, a unique filling system that allows a greater ink capacity and safe usage during air flights. The fountain pen is further enhanced with Visconti's large 23kt Palladium Dreamtouch nib.